Who is responsible for ensuring young workers, future workers, and older workers have the required skills to adapt to the evolving world of work? This article was previously published in the World Economic Forum Blog, on February 20, 2019. The world is undergoing a disruptive, yet exciting digital revolution, where artificial intelligence (AI), automation, demographic changes, globalization, and social developments are transforming every workplace. Who is responsible for ensuring young workers, future workers, and older workers have the required skills to adapt to this evolving world of work? A collective response is required, and business leaders have an essential role to play. More so than ever before, we are turning challenges into opportunities by connecting pressing issues, such as ensuring diversity and inclusivity in the workforce with the alignment of education and industry needs. These issues are key drivers of both business productivity and equitable social development. As companies and business leaders, we are proud to contribute to resolving the education and skills challenges our world faces. Through smart investments and solid partnerships with NGOs, governments, and donors, we are catalyzing a stronger push to make a real impact on transforming education and skills to prepare workers for the jobs of today and tomorrow. Our commitment to the Global Apprenticeship Network (GAN) supports constructive partnerships between the public and private sectors, which are essential to ignite fundamental change in the world of work. Partnerships like these can scale solutions collectively while creating new market and investment opportunities. One pragmatic solution to maintain a strong workforce while contributing to local communities is through apprenticeships and work-based learning. In our experience, this model can be leveraged to enhance the skills and diversity of our workforce while creating a pathway to next-generation jobs. We cannot tackle these issues as singular entities however; we must strive towards collective action. Through platforms, such as that of the GAN, we can drive change at the local level, testing apprenticeships and other work-based learning models in various communities, including those that serve vulnerable groups. Although employers and industry leaders have reiterated the 4Cs (critical thinking, communication, collaboration, and creativity) as essential to the future of work, a huge gap remains and many employers struggle to find skilled labour. The GAN believes the challenges of today – unemployment, skills mismatch, and sustainability – are best addressed through employer-led education. As both employers and pioneers of new technology, we are delighted to make a meaningful contribution. The ability to thrive in this digital transformation requires a different approach to how we attract, develop and retain talent. The Rework America Business Network, for one, focuses on the development and advancement of skills-based hiring and training practices with an emphasis on demonstrable skills. By promoting a skills-based approach to employment that "screens in" for skills, we are creating a more equitable job market. For example, those that may not have traditional credentials like four-year degrees – such as veterans and returning to work adults – have better opportunities for integration into the workforce. The GAN believes that networks like this can increase the number of US workers, creating better pathways to career success by encouraging employers to adopt skills-based practices. 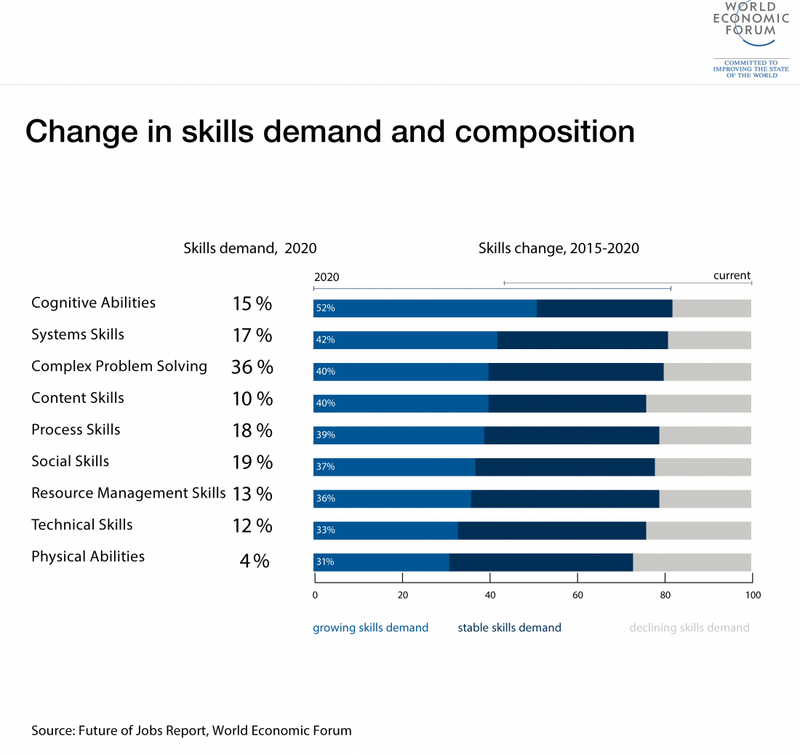 The World Economic Forum’s report on “The Future of Jobs”, confirms longstanding beliefs on the need to train and re-skill the workforce. Microsoft’s investment in cities and skills, through its partnership with Markle’s Skillful Initiative and other activities across the globe represents its commitment to addressing the skills gap. By joining forces with Skillful, Microsoft continues to inspire, facilitate, and lead the shift to the 21st Century labour market while helping people transition into jobs in the digital economy. This investment further ensures critical skills are available to small and medium enterprises, who often find it challenging to invest in such training programs. Microsoft’s publicly available Microsoft Professional Program now has an AI track, offering AI-specific online courses and instructional videos from expert instructors. The company also created a developer-focused AI School, which provides online videos and other assets that help build professional AI skills. In the UK, Microsoft launched a comprehensive national skills programme to boost digital capabilities and tackle the skills gap. Building on past work where 15,000 apprenticeships were created, one of the key objectives of this initiative is to create 30,000 new digital apprenticeship roles through the Microsoft Apprenticeships programme. Zurich Insurance has introduced a first-of-its-kind apprenticeship programme in the US. The innovative two-year programme allows apprentices to simultaneously gain the education and experience to launch a career in commercial insurance, as well as earn a salary with benefits, and pursue a tuition-free degree; unlocking new possibilities for their future. Zurich has pledged to train 100 apprentices in the programme by 2020, demonstrating its commitment to sustainability of the workforce via re-training and education for changing skill-set needs. The Society for Human Resource Management (SHRM) joined a White House initiative to expand workforce training in America by committing to educate and equip more than 127,000 HR professionals through its SHRM-Certified Professional and SHRM-Senior Certified Professional programmes over the next five years. A key issue within education is that of non-traditional talent pools, such as those with a criminal record. In the immediate wake of the First Step Act becoming law, which improves rehabilitation and re-entry opportunities for thousands of incarcerated men and women, SHRM is partnering with business and HR leaders to take the next step in adopting best practices for hiring people with a criminal record. These are just a few demonstrations of the immense possibilities, if the trend of private sector-led development continues. In this new era, forging tactical partnerships with government, NGOs, and other development actors, enables us not only to create new investment opportunities for businesses, but also to improve the lives of employees and the communities where we live and work.